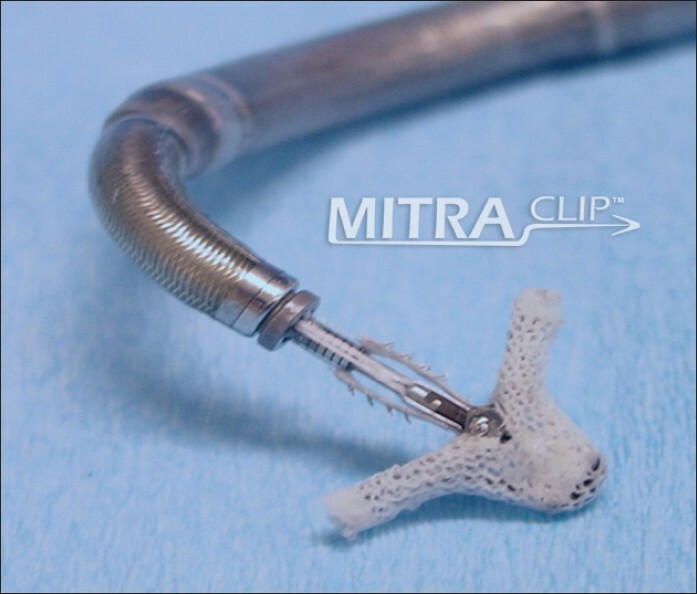 The MitraClip [Figure 1], Abbott Inc., North Chicago] is a catheter-based device designed to perform an edge-to-edge repair of the regurgitant mitral valve (MV) in the beating heart as an alternative to the conventional surgical approach. ,, Percutaneous MitraClip device implantation has been shown to reduce the severity of mitral regurgitation (MR), significant reduction in left ventricular (LV) volumes and improvements in New York Heart Association (NYHA) functional class  in patients with symptomatic severe MR who are not suitable for surgical repair of MV due to excessive co-morbidity. This technique simulates the Alfieri suture MV repair technique that is performed surgically using the standard cardiac surgical approach and cardiopulmonary bypass (CPB). The MitraClip implantation, when successfully performed creates a double orifice that resembles a figure-of-eight [Figure 2]. The technique has been prospectively evaluated in the randomized EVEREST II study  and short-term and midterm outcomes have been encouraging. When compared with surgical MV repair the quantitative reduction in MR is less, but nonetheless substantial. Like surgery, the MitraClip therapy is associated with improved quality-of-life and functional capacity. MitraClip placement can be effective for either degenerative or functional MR if there is sufficient central leaflet surface to allow grasping by the clips. A significant proportion of patients require two clips (or) more to obtain sufficient MR reduction. The surfaces of the clips endothelialize with time while seldom inducing mitral stenosis. The advantages of the percutaneous MV repair compared to open heart surgery include avoidance of sternotomy and CPB, repair of the MV in a beating heart, reduction in post-operative duration of mechanical ventilation, intensive care unit stay and requirement of blood transfusion. Acute problems during MitraClip placement include procedural failure, worsening of MR, creation of mitral stenosis, creation of an atrial septal defect and rupture of the right or left atrial walls with a possibility of cardiac tamponade. 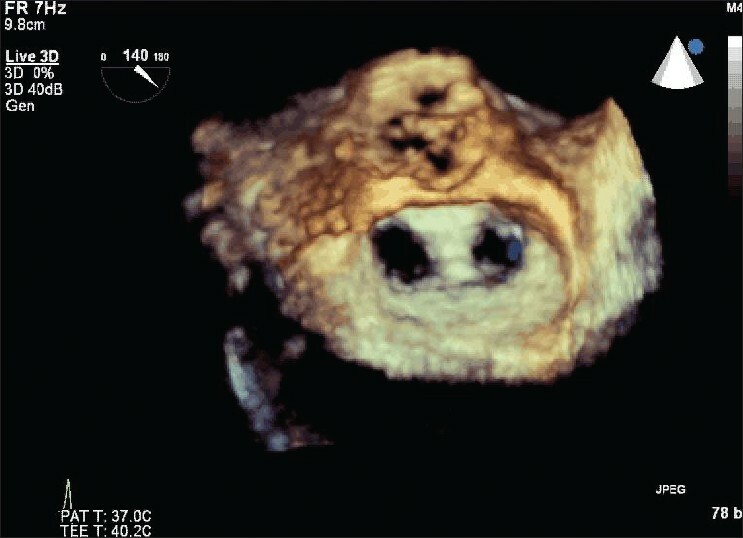 Small series of MitraClip patients who have required late surgical intervention (primarily for residual MR, rarely for mitral stenosis) suggest that open MV repair is complicated by the presence of MitraClip(s), yet remains possible for most patients , although some patients require MV replacement. Although much has been described about the outcomes of this therapy in various patient groups, little is known about the anesthetic considerations. 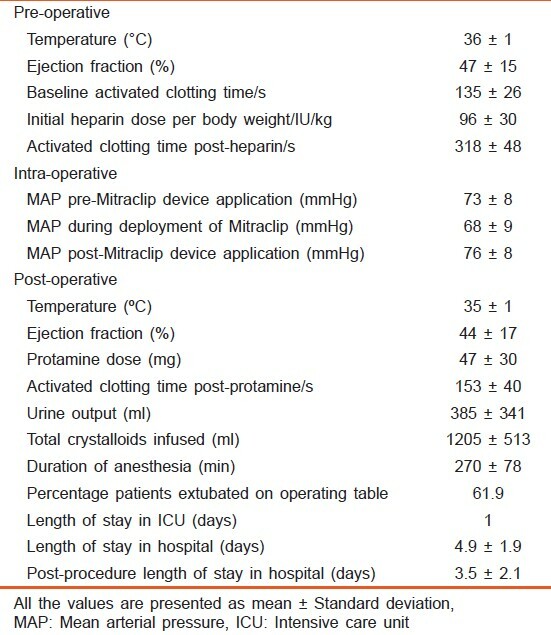 In this retrospective analysis, we describe our experience of anesthesia management for patients who were treated with MitraClip for severe MR.
Institutional review board approval was obtained for this single center retrospective analysis of anesthesia management for MitraClip for severe MR in high-risk patients. Pre-operative patient data were extracted from the electronic and paper medical records. The data collected included patient demographics, clinical characteristics and echocardiography findings including left ventricular ejection fraction (LVEF) and the severity of MR. Intra-operative and post-operative extracted patient data included details of intravenous access, intra-arterial and central venous lines, temperature monitoring, intra-operative opioids, muscle relaxants, vasopressors and the anesthetic drugs used. Transesophageal echocardiography (TEE) findings were also recorded. All the included patients met American College of Cardiology/American Heart Association indications for MV surgery. The specific criteria were patients with severe (3-4+) MR who were symptomatic with preserved LV size and function; asymptomatic with LV dysfunction or increased LV size, with recent onset atrial fibrillation or evidence of pulmonary hypertension; or symptomatic patients with severe LV dysfunction (LVEF <30%) despite optimal medical therapy. Patients were selected for the MitraClip implantation after evaluation by a team including the referring cardiologist, interventional cardiologist, cardiac surgeons, echocardiologists and cardiac anesthesiologist. These patients were considered high-surgical risk or had functional MR where surgery is considered of limited value. MitraClip was the first percutaneous device to receive European CE and thus has the greatest end-user experience. This procedure is performed by a multidisciplinary team involving interventional cardiologists, echocardiologists, cardiac surgeons, cardiac anesthesiologists, nurses and radiographers. The procedure is performed under general anesthesia and with 3-dimensional TEE and fluoroscopic guidance. TEE provides baseline measurements and crucial imaging guidance throughout the procedure. Vascular access is obtained with an 8F sidearm sheath in the right and left femoral veins and a 6F sheath in the left femoral artery. Right heart catheterization is first performed to document right-heart pressures. Transeptal puncture is then performed under TEE guidance. The transseptal puncture is a critically important part of the MitraClip procedure as it determines the approach of the clip towards the MV. Inappropriate location of the puncture can severely hamper maneuverability of the device. 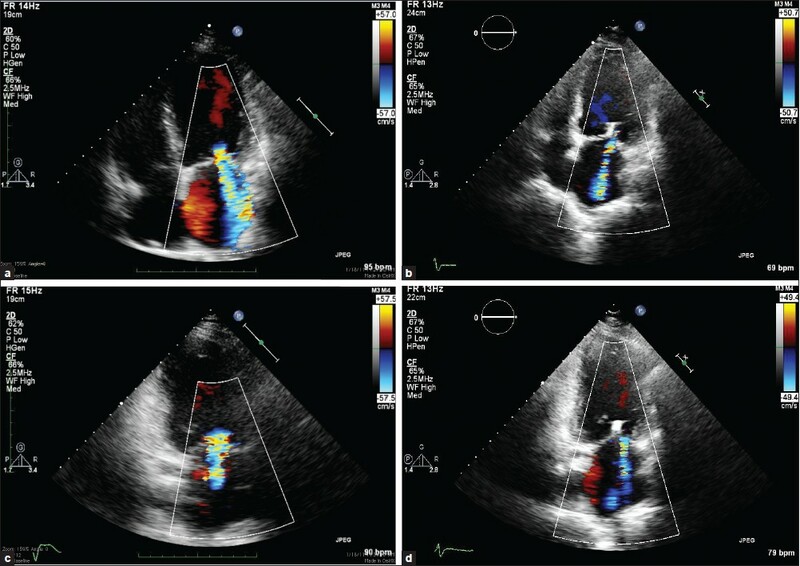 Once the transseptal puncture is performed, the MitraClip Guide and the clip delivery system are advanced under TEE guidance into the left atrium and the MitraClip is positioned over the MV, carefully avoiding the left atrial wall. Various TEE views guide positioning of the clip across the regurgitant jet [Figure 3]. The MitraClip is then advanced with the clip arms open into the left ventricle. Further adjustments are then made under fluoroscopic and TEE guidance. Once positioning is felt to be ideal, the mitral leaflets are grasped under real-time TEE guidance and the clip closed. The clip is then released from the delivery catheter and the MV interrogated by TEE for adequacy of leaflet capture, degree of residual MR and evidence of mitral stenosis. The MitraClip can be reopened and repositioned if TEE indicates that it is not optimally placed. , Right and left heart catheterization is then repeated to document final hemodynamic parameters. The guide catheter is then removed and the femoral punctures are percutaneously repaired with Proglide devices (Abbott Vascular, Abbott Park, Illinois, USA). The anesthetic management evolved significantly during the initial multidisciplinary learning curve associated with this novel procedure. Anesthetic management of these patients proceeded as that for any patient for cardiac surgery. Initially, the patients were prepared as for surgical repair of MV, with invasive arterial and central venous catheterizations. Following communication with the interventional cardiologist and anesthesiologists from other centers providing MitraClip device implantations, a more "minimalist" approach was adopted and central venous catheterization was omitted. When the procedure was performed in the catheterization laboratory, provision to accommodate and manage the unexpected emergency with the main operating theatre management was made. Of the 21 patients, four had their procedures performed in the catheterization laboratory and 17 had their procedures in the hybrid operating theatre. All patients had general endotracheal anesthesia, with 3-dimensional TEE and fluoroscopic guidance for MitraClip device implantations. The demographic characteristics, co-morbidities, pre-and post-operative data are shown in [Table 1], [Table 2], [Table 3], [Table 4]. Anesthetic induction of all patients was performed with bolus dose of etomidate or propofol, fentanyl and non-depolarizing muscle relaxant to facilitate oral tracheal intubation with an appropriate size endotracheal tube. 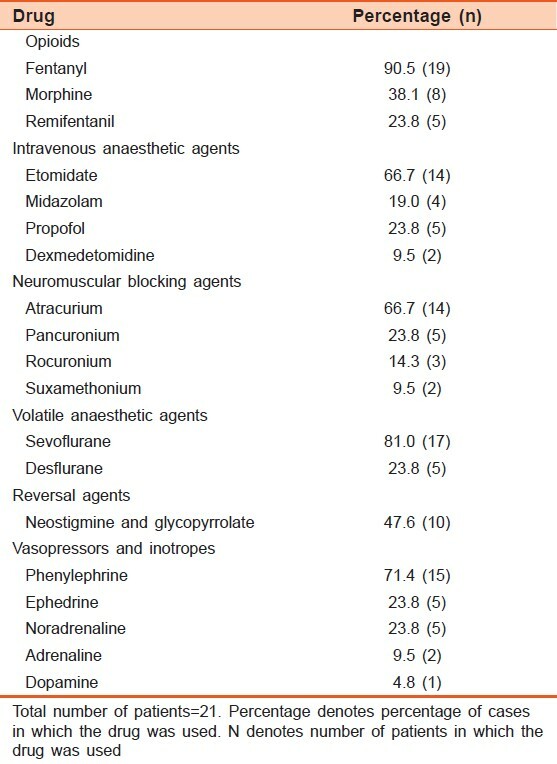 Anesthesia was maintained with either sevoflurane or desflurane. Routine intra-operative ventilation was accomplished using a Datex-Ohmeda Aestiva/5. Hemodynamic monitoring consisted of an electrocardiogram, pulse oximetry, an invasive arterial blood pressure and central venous pressure monitoring for the first six patients. The patients were in supine position and placement of the MitraClip device was via the right femoral vein. Heparin was administered upon crossing of the inter-atrial septum with the transseptal needle and catheter and activated clotting time (ACT) was maintained beyond 250 s throughout the procedure; the ACT was checked every 30 min. The ventilator breath hold was required during critical junctures of the procedure. For example, during difficult grasping attempts or when a second clip is being advanced from the left atrium to the LV, with special care taken to avoid damage to the first clip. In some patients, relative hypotension was observed when the MitraClip crossed the MV. We suspect that in these instances, there may be interaction between the device and valve apparatus or that the device affects mitral inflow. During these instances, the circulation was supported by the use of vasopressor agents. At the end of each grasp and before the release of the device, the blood pressure is increased pharmacologically to simulate wakeful physiology. The blood pressure is typically raised to at least the level prior to anesthesia. This allow evaluation of the extent, location and severity of any residual MR; which in turn determine if the clip should be deployed and or if another clip is required. Intravenous protamine was administered at the end of the procedure to reverse anticoagulation. All patients were monitored overnight in the ICU. Majority patients were admitted a day prior to the procedure. All Patients tolerated general anesthesia well, and there was no anesthesia related complications. 12 patients were extubated on table, the remaining patients were electively ventilated. The MitraClip device was successfully implanted in 19 of 21 patients. The patient's pre-operative demographics and co morbidities are listed in [Table 1]. 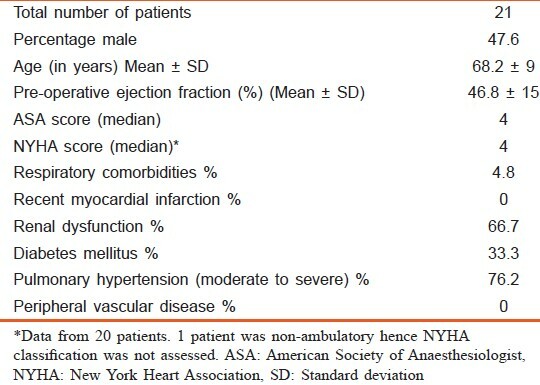 All 21 patients were unsuitable for open-heart surgery with a median American Society of Anesthesiologists (ASA) Physical Status of 4 and median NYHA score of 4. Moderate to severe pulmonary hypertension was present in 76.2% patients and the mean pre-operative ejection fraction was 46.8%. [Table 2] 0 summarizes details on the anesthetic management of these patients. Reduced doses of anesthetic agents appropriate for the advanced age, multiple co morbidities and severe valvular heart disease were required. For the management of hypotension, phenylephrine was administered to 15 patients and ephedrine was used in 5 patients. For persistent hypotension, noradrenaline infusion was used in 5 patients and adrenaline infusion was used in 2 patients. Dopamine was used in a single individual as an adjunct to phenylephrine and ephedrine. [Table 3] 0 shows the peri-operative parameters. There was an insignificant decrease in the mean arterial pressure from 73 mmHg to 68 mmHg during MitraClip device implantation. The median hospital stay was 5 days (interquartile range 4-7 days). Most of the patients recovered quickly from the procedure and the post-procedural period typically involved overnight observation in an ICU and a follow-up TTE. The median post-procedural time to discharge was 3 days (interquartile range 2-5 days). [Table 4] demonstrates the significant improvement in MR grade at 3 months post MitraClip device implantation. On average, the MR grade improved from severe to mild-moderate. One patient had the procedure aborted due to a torn Chiari network that was pushed across the inter-atrial septum by the guide into the left atrium. The MitraClip was not used at all as the risk of dislodgement and embolization of the Chiari network was deemed too high to proceed. A second patient had the leaflets and chords of the MV torn during clipping, and the procedure was aborted, the patient eventually underwent salvage open-heart surgery. In this retrospective analysis, we report our anesthetic experience and considerations for patients undergoing percutaneous MitraClip procedure. General endotracheal anesthesia was used in all the patients for the following reasons: (1) It facilitates the intra-operative use of TEE to guide the precise placement of the MitraClip; (2) it allows the use of controlled breath holding at critical junctures of the procedure such as while positioning a second clip; and (3) it allows for prolonged use of TEE and ensures that the patient does not move during the procedure. The use of intracardiac echocardiography may allow this procedure to be performed under local anesthesia. The anesthesia challenges of the procedure are similar to those of conventional cardiac surgery. However, there are some unique features worthy of note. Unlike conventional surgery, there is extensive use of the TEE and may involve significant movement of the probe. In our initial experience, the concomitant use of a nasogastric (NG) tube resulted in some bleeding from the esophagus, possibly because of abrasions caused by the interaction between the TEE probe and the NG tube. Similarly, with the increased movement of the TEE probe, there is also increased theoretical risk of inadvertent dislodgement of the endotracheal tube. Second, like cardiac surgery, anticoagulation is required. This is upon crossing of the inter-atrial septum and an ACT of > 250 s was maintained in all patients during the procedure. Protamine is given at the end of the procedure to allow hemostasis upon withdrawal of the 24F guide from the right femoral vein. Steps specific to the MitraClip procedure include: (1) Breath holding during specific procedural steps of the MitraClip to allow precise placement of the device; (2) Careful attention when the device crosses the MV; and (3) Use of inotrope(s) or vasoconstrictor to raise the blood pressure in order to adequately assess the severity of residual MR.
From a systems standpoint, the anesthesia team must be prepared to deliver anesthetic care in a location away from their usual operating room environment. From a practical perspective, this means an understanding of the working area, the resources and equipment available such as oxygen source, medications, nursing support etc., as well as having a back-up plan in the event of an unexpected emergency. Future developments that may improve patient safety with this procedure include smaller profile catheters and sheaths that minimize trauma to the vascular access site. Finally, while not directly related to the procedure, the anesthesiologist needs to be aware of the hazards of radiation. It is crucial to inform the operator when stepping into the working field of the operator. Similarly, the operator has to be mindful of the anesthesiologist before using fluoroscopy. Percutaneous MitraClip implantation is a new and exciting development in the treatment of severe degenerative or functional MR. Currently, its use is limited to patients considered high surgical risk or unsuitable for conventional surgery. The MitraClip procedure can usually be performed safely under general anesthesia in the vast majority of these sick patients but serious complications can occur. These must be anticipated by the anesthesiologist and managed in an expeditious fashion. Teamwork, communication and a thorough understanding of the perioperative anesthetic and hemodynamic management are required to ensure successful outcome in this new percutaneous therapeutic option for the high-risk patient. Feldman T, Kar S, Rinaldi M, Fail P, Hermiller J, Smalling R, et al. Percutaneous mitral repair with the MitraClip system: Safety and midterm durability in the initial EVEREST (Endovascular Valve Edge-to-Edge REpair Study) cohort. J Am Coll Cardiol 2009;54:686-94. Feldman T, Wasserman HS, Herrmann HC, Gray W, Block PC, Whitlow P, et al. Percutaneous mitral valve repair using the edge-to-edge technique: Six-month results of the EVEREST Phase I Clinical Trial. J Am Coll Cardiol 2005;46:2134-40. Franzen O, Baldus S, Rudolph V, Meyer S, Knap M, Koschyk D, et al. Acute outcomes of MitraClip therapy for mitral regurgitation in high-surgical-risk patients: Emphasis on adverse valve morphology and severe left ventricular dysfunction. Eur Heart J 2010;31:1373-81. Franzen O, van der Heyden J, Baldus S, Schlüter M, Schillinger W, Butter C, et al. MitraClip® therapy in patients with end-stage systolic heart failure. Eur J Heart Fail 2011;13:569-76. Yuksel UC, Kapadia SR, Tuzcu EM. Percutaneous mitral repair: Patient selection, results, and future directions. Curr Cardiol Rep 2011;13:100-6. Fukamachi K. Percutaneous and off-pump treatments for functional mitral regurgitation. J Artif Organs 2008;11:12-8. Jilaihawi H, Makkar R, Hussaini A, Trento A, Kar S. Contemporary application of cardiovascular hemodynamics: Transcatheter mitral valve interventions. Cardiol Clin 2011;29:201-9. Argenziano M, Skipper E, Heimansohn D, Letsou GV, Woo YJ, Kron I, et al. Surgical revision after percutaneous mitral repair with the MitraClip device. Ann Thorac Surg 2010;89:72-80. Geidel S, Ostermeyer J, Lass M, Schmoeckel M. Complex surgical valve repair after failed percutaneous mitral intervention using the MitraClip device. Ann Thorac Surg 2010;90:277-9. Rogers JH, Franzen O. Percutaneous edge-to-edge MitraClip therapy in the management of mitral regurgitation. Eur Heart J 2011;32:2350-7. Tamburino C, Ussia GP, Maisano F, Capodanno D, La Canna G, Scandura S, et al. Percutaneous mitral valve repair with the MitraClip system: Acute results from a real world setting. Eur Heart J 2010;31:1382-9. Abbott website. Available from: http://www.abbottvascular.com/us/index [Last accessed on 2013 Dec 24 th ].